Another fun year of Road Atlanta track action awaits for 2017. MVP Track Time is pleased to announce our 9th annual “Flyin’ Turkey Trot” Road Atlanta November 18-19 track event. I hope you’ll join us for the on-track fun. MVP’s goal remains the same since we began in 2006, offering you more actual track time at each event for less money. Our three run-group format (Novice, Intermediate and Advanced) offers you maximum driving time (2+ hours of scheduled daily track time) instead of standing around the paddock. 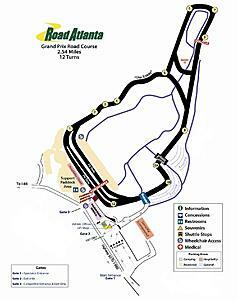 Please feel free to join us at Road Atlanta November 18-19, 2017 for the on-track fun. All courteous, considerate, safe drivers are invited and welcome. Please, don’t hesitate to contact me if you have questions.